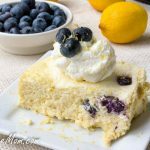 This Slow Cooker Cake is sugar free, gluten free, grain free, low carb and filled with lemony custard and blueberries! 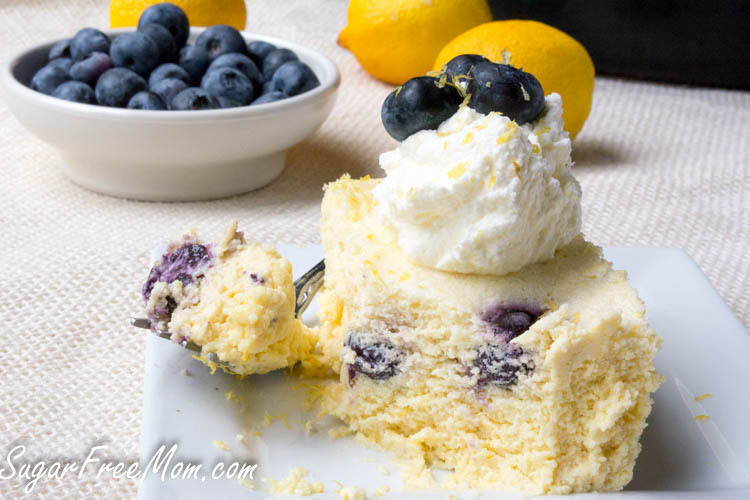 If you love creamy custard and you love cake, this combo of textures will rock your boat! 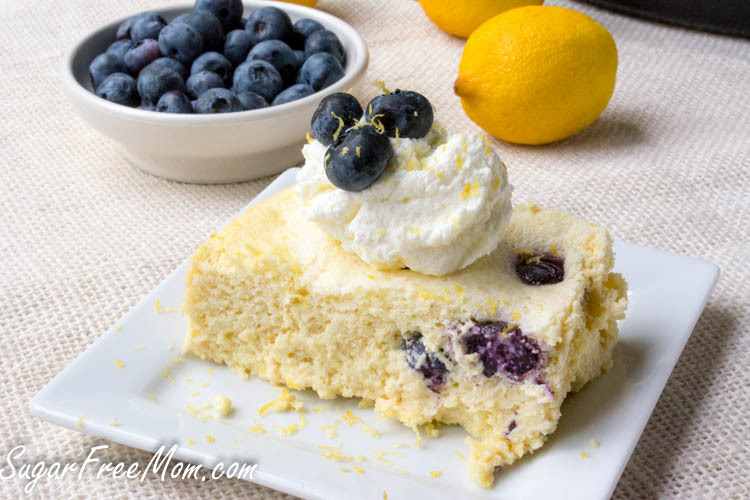 Lemon lovers should look no further, this is full of lemony, zesty flavor, but even if you’re not much into lemon you can easily adjust the amount used in this recipe to your liking! 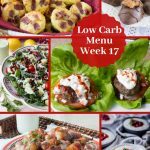 If you’ve never made dessert in a crock pot, welcome to a whole new world you will soon fall in love with! Crock Pots or slow cooker, whatever you like to call them, are awesome to use for savory meals. 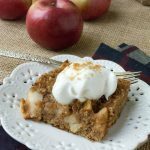 But once you venture to the dessert side, you will be surprised at how quickly you will be hooked to making this for friends and family. 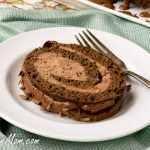 As long as you’re not looking for a perfect looking cake, neat and tidy kind of cake and you’re more interested in a simple, but tasty treat for family and/or company, desserts in the crock pot are the way to go. Dump, make sure it’s plugged in, cover and set! Come back in a few hours for some deliciousness! 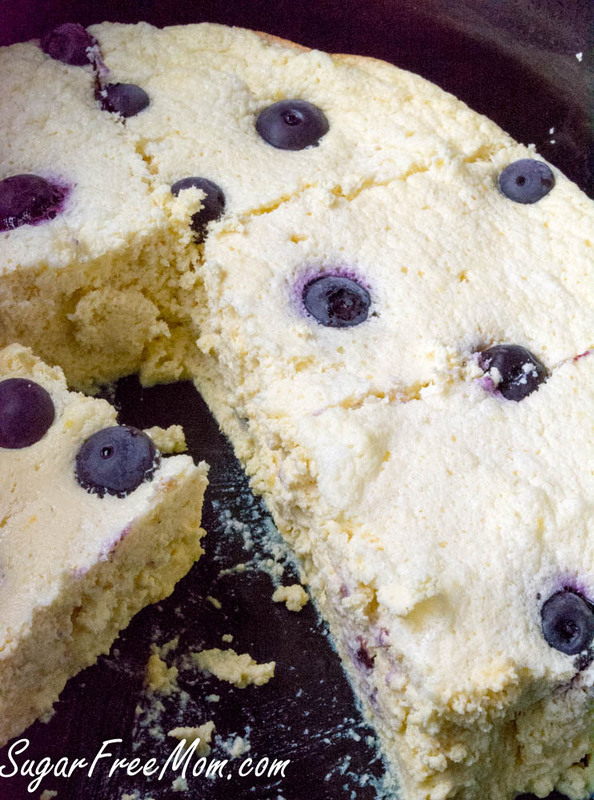 My youngest child, who is quite the coconut hater, can’t tell this slow cooker cake is made with coconut, and that has been what has driven me to continue to persevere with coconut flour. 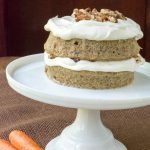 Youngest has a tree nut allergy so very often I’ve got to make low carb recipes using coconut flour as opposed to almond flour. Often he can detect it and makes complaints. But not this year folks, not this year. I am winning 5 out of 5 thus far! I’ve made a Chocolate Tiramisu Cake Roll, Low Carb Cheddar Sausage Bagels, Tiramisu Mug Cake Low Carb Banana Cream Pie Cupcakes and now this and he’s had no idea! Tastes like a custard, formed like a cake! Easy to make, no oven required! Set it and forget it! 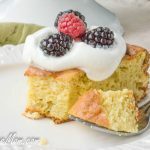 Top with some sugar free whipped cream and a few berries and call it a day! 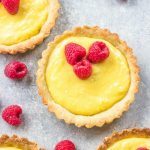 You can substitute the swerve sweetener with another sugar free sweetener of choice, but often other brands are sweeter so I would either use 1/4 cup of something else or eliminate the lemon stevia. You could even use canned coconut milk in place of the heavy cream and make it dairy free. If you’re not a fan of lemon as much, reduce the amount of juice I used here to just 1/4 cup. 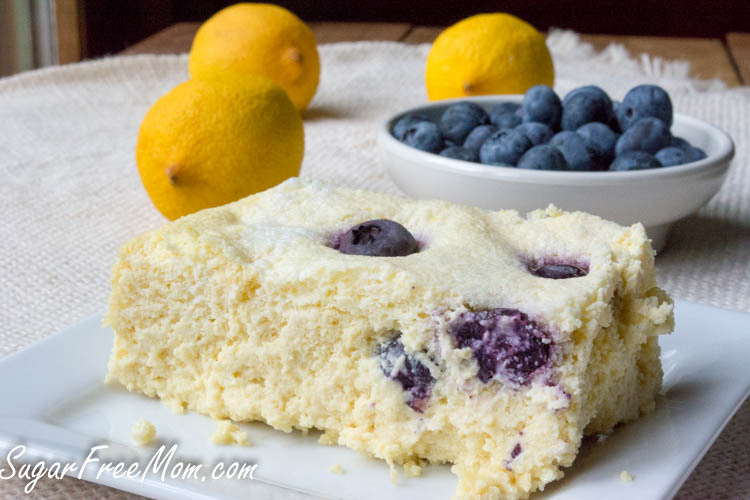 If you’re not much of a fan of lemon than perhaps you’d like my Crock Pot Fudge. 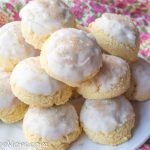 This recipe was first published in August of 2016. Place the egg whites into a stand mixer and whip until stiff peaks form. Set aside. 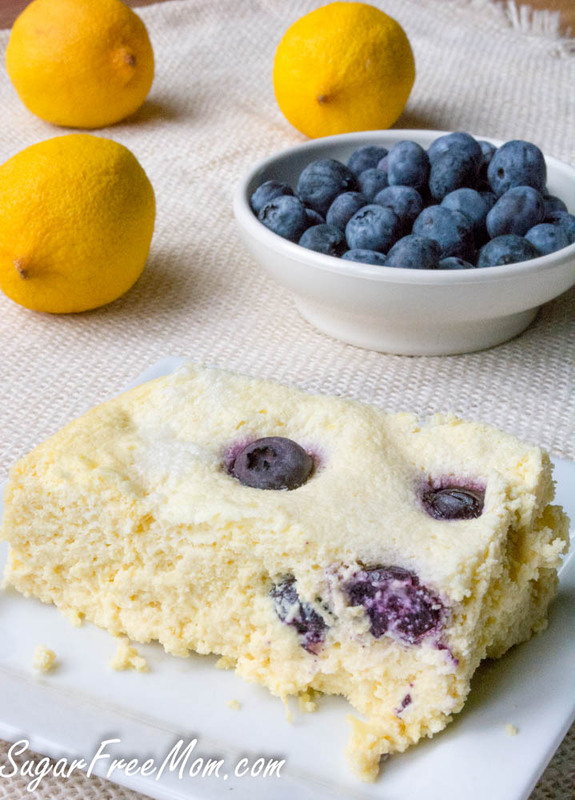 In another bowl, whisk the yolks and remaining ingredients together except blueberries. Fold the egg whites a little at a time into the batter until just combined. Grease the crock pot and pour the mixture into the pot. 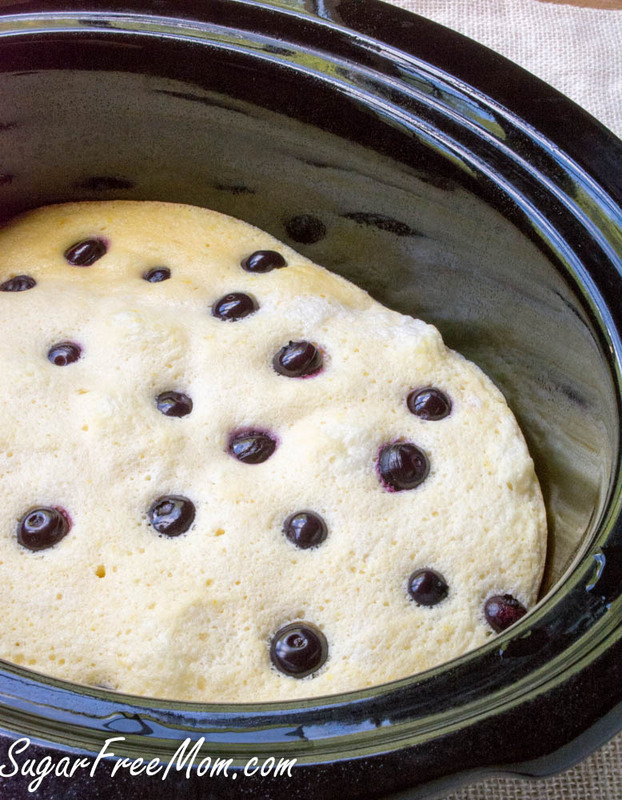 Sprinkle the blueberries over the batter. Cover and cook on low 3 hours or until a toothpick come out clean. Allow to cool with cover off for 1 hour then place in the refrigerator to chill for 2 hours or overnight. Serve cold with a little sugar free whipped cream if desired. love this recipe, but I don’t have a crock pot. What else can I use? Low oven temperature? This can go into the oven at 350 degrees F for about 30 minutes. So, would you please clerify it: it should go for low temperature for 3 hours (than what is the temperature? ), or 350 F for 30 mins??? And if not in crock pot, how to adjust the temperature, And time? 350 degrees F for 30 minutes, but check center with a toothpick, if it comes out clean it’s done if not try 10-15 more minutes and check again. I baked this for church today. Buttered a glass 9×13 inch glass pan and baked it at 325 for 35 mins>depends on your oven. Everyone loved it and requested the recipe. Yes if you have a larger crock pot then double the recipe and the cooking time may need to be increased. Is this baked in a 6 qt crockpot? Yes sorry should have mentioned it. I’m thinking that this would be perfect to make in one of those new 9 x 13 shallow crockpots that I have been seeing in the store. I’ve been trying to talk myself into buying one of those, this recipe may have pushed me over the edge. I’ve not seen one of those, I will have to check it out, thanks! It’s not completely necessary, so if you don’t have it you can eliminate it but you may need to increase whatever sweetener you are using. If I used the oven method what size pan should I use? I would place this into a 9 by 13 pan. Do you think this would work in an instant pot? 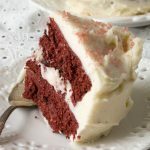 That I have not tried, my instant pot does have a crock pot setting but the shape of it would not work so well as a cake I don’t think, that’s why I used my oval crock pot. Custard in a crock pot huh? Now that’s a new one! I LOVE my crockpot, but I haven’t tried to make dessert in it really before. Could I double this in a larger crock pot.. Haven’t ever made cake in a crock pot… What a terrific idea. I think we’ll try them all!! I think it could but you may need to reduce the cooking time. I made this last night and it turned out really well! I used 1/4 cup of erythritol and 10 drops of liquid stevia. I also used chopped up strawberries because that’s all I had. I actually think I left too much air in the custard, it would be nice if it was denser. Never thought that could happen! Also, watch the cake in your crockpot, cause mine is always quicker than a recipe tells me. Mine was done around the 2 hour mark. Ok, I feel dumb…. do I serve this out of the crock pot or remove it to serve? I’m so excited about this, it’s cooking now for a pot luck at work tomorrow! I serve out of the crock pot piece by piece. I want to make this tonight but have heavy cream instead of light. Will it work as well? Oh sure, and it will probably be delicious! I can’t have dairy so could I use coconut milk? I know this is a sugar free website but I don’t believe in stevia or any of the other fake sugars. I cannot stand the taste of stevia. Could I use coconut sugar? I don’t need to be sugar free but am trying to cut down on sugar without having to use the pretend stuff. You can certainly use whatever sweetener you prefer. Can you sub almond flour for the coconut flour? If so, same amount as the coconut flour? interested in the response to this as well .. I have a coconut allergy. 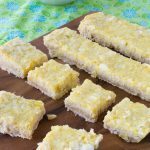 Unfortunately swapping almond and coconut is very difficult without having to change other liquid ingredients in a recipe as coconut is so much more absorbent. I am only guessing since I can’t use almond since my son has a tree nut allergy. I think you’d need to at least double the amount I used for coconut flour, but again not sure how the custard texture will come out since I’ve not tested it. FANTASTIC!!! I used a combo of Swerve and SweetLeaf Stevia and it tastes like it was made with sugar. It has a lemon meringue flavor, which is a fav from my childhood. Hubby loves this dessert as well. Thank you! I made this desert tonight & it was quite yummy & worked well, although mine was a little darker around the edges & cooked in about 2 hours. However, I only used a pure form of Stevia powder to sweeten it which unlike the granular stevia based sugar replacements contains no sugar alcohols. I use this product because the erythritols etc make my stomach gurgle like crazy! But the stevia is a fine powder & I only need a teaspoon of it for example. Can you suggest something else I can combine with my stevia powder to provide the bulk of the granular products in your recipes & still be sugar free? Or do you think the bulk of the granular sugar replacers isn’t a big factor in a recipes success? I’ve not used Xylitol but heard it’s similar to sweetness of sugar, but not sure if it would bother your stomach like erythritol.Another option might be monk fruit, but again I haven’t used it much but I’ve heard good things about the Lakanto brand. I use Monkfruit and love it. I get it from the bulk food store and does not effect sugar alcohols at all. Would this work if I replaced 2 cups heavy cream with 2 cups of almond milk instead? The fat content is way too much for me using 2 cups of heavy cream. Thanks! I wouldn’t. Almond milk is much thinner than cream, and would likely require significant tweaking of the rest of the ingredients. Maybe try it with canned coconut cream? 16 gm fat per 1/3 cup vs 26 gm fat per 1/3 cup heavy cream. I just made this. Can’t wait to try it on later. Can I freeze left over? Custards can be funny when frozen, might loose the nice creamy texture when it thaws out. This looks & sounds amazing! Was wondering if i can use regular sugar(reg. or brown) as artificial sweeteners usually give me bad headaches. Also can you use regular flour? One last question can almond milk be used & if so would it be a diff measurement as the consistency is diff? Ty so much! Can’t wait to try this! You can use regular flour and any sweetener you like. 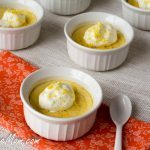 Using almond milk which doesn’t have much fat will not produce a nice custard like texture. Could I make these as cupcakes in the oven? What baking temperate and time do you estimate? You could and do a water bath for them and bake at 325 for maybe just 30 minutes. This never formed up for me. Cooked it for about 5 hours and a toothpick never came out clean. Just got a lump of mush. Got any idea what might have happened? The only change I made was to use 1/2 cup of coconut sugar instead of Swerve. Did you use almond milk? I don’t have swerve sweetener, so could I use xylitol? Can I use xylitol instead of erithytol? Yes but probably use less as swerve is not as sweet as xylitol. Hi Brenda, I notice that you frequently say Swerve is less sweet than xylitol or other sweeteners. It’s true that straight erythritol is about 70% as sweet as sugar, whereas xylitol is supposed to be about equal to sugar in sweetness. According to the manufacturer, though, Swerve (which is erythritol + oligosaccharides) is equal in sweetness to sugar and measures 1:1, like most granulated xylitol. Sweeteners taste so different from one person to the next, so I totally get that, per your comments, Swerve is likely less sweet for you. Actually, it is less sweet for me too, so much so that I rarely use it without supplementing a few packets of Truvia or another sweetener! Nevertheless, according to the manufacturer, Swerve is apparently sweeter than you and I perceive it to be. Just wanted to let you know! What about half and half? I’m pretty sure it calls for 2 cups heavy cream right? This cake turned out awesome! Thank you for the recipe. I know this is a crazy question, but I was wondering if you or any of your readers might have an answer for me. I love the taste of lemon (and really miss it) but I get headaches if I eat too much of it. Lemon rind doesn’t bother me like the juice does so I bought some lemon extract (which is basically lemon oil from the rind and not the juice) and am just beginning to experiment with it. If I substituted the 1/3 cup lemon juice with a liquid (water? almond milk?) and replaced the lemon liquid stevia with the lemon extract, how much do you think I should use? Should I replace the lemon juice with something else tarter (vinegar?) Eek, I’m hopeless at substituting things and would appreciate a little guidance if anyone has any ideas. Maybe sub 1/3 lemon juice with water and add 1 teaspoon lemon extract. You can’t replace the liquid lemon stevia with just lemon extract because there is no sweetener in lemon extract. The liquid stevia is quite sweet but if you can’t have that try Swerve confectioners sweetener, sadly though it is only 70% as sweet as sugar so you may need to use 1 cup of it.